The Gear S3 is headed for an unveil this September at IFA 2016 (which is Samsung's chosen announcement location), but, outside of the smartwatch codename and some rather dubious images leaked regarding the device, and its rotary bezel (which debuted on the Gear S2), little else is known. 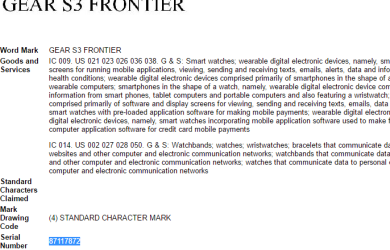 Now, Samsung has filed a trademark for "Gear S3 Frontier," which we have an idea may pertain to the name of the new smartwatch. We don't know anything else at the moment except that this is a working monitor for a new smartwatch from Samsung. This could pertain to a more ruggedized smartwatch for those who want something more element-resistant than the current Gear S2 and Gear S2 Classic offerings. You can see the trademark document below. 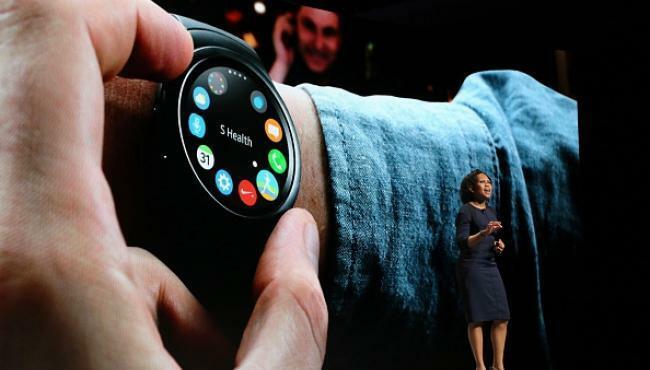 The Gear S2 is Samsung's most popular smartwatch today, but the Korean giant has had good experience with smartwatches -- having produced the first-generation Galaxy Gear, followed by the Gear 2, Gear 2 Neo, Gear S, and finally, the Gear S2, as well as fitness bands Gear Fit and the newly-released Gear Fit2. At one point, watches such as the Galaxy Gear ran Android but Samsung finally moved the Gear 2 and Gear 2 Neo to Tizen, with all smartwatches after that running Samsung's homegrown Tizen OS. The Gear S3 will become Samsung's sixth smartwatch on the market when it drops in a matter of weeks.